Today’s blog is very special as it is my first ever GUEST POST! This past weekend I had a fabulous visit from one of my former college roommates and bridesmaid, Tara. 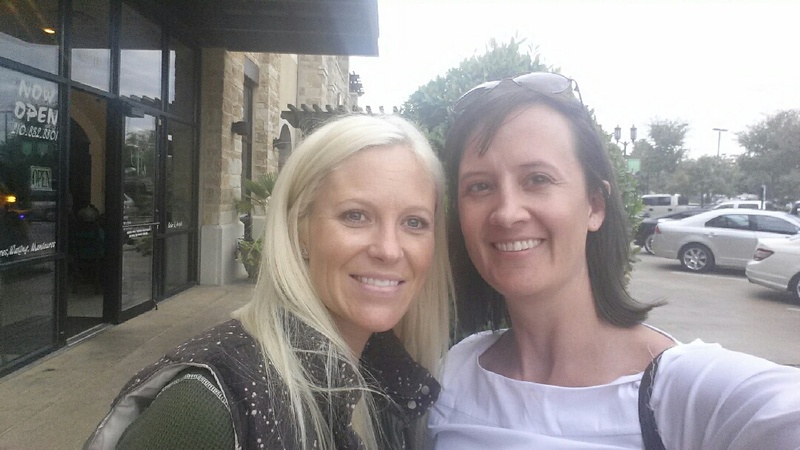 I’ve wanted to start featuring occasional guest posts on my blog for quite some time now, and so I’m very excited to have Tara as the first, and to share her recent visit to Texas to see the Lehnhoff clan! The main purpose for her visit was to run our fourth annual half marathon together, but it just so happened that we were also able to celebrate Halloween together as well! Tara is an attorney in Phoenix, Arizona and focuses her practice primarily on civil rights litigation. And as her firm’s biography very accurately states, “In her spare time, Tara likes to travel to Third World destinations, scuba dive, attend modern sewing workshops, and search for the world’s best breakfast taco.” Ladies and gentlemen, I introduce to you, Tara and her Diary of a Weekend With The Lehnhoffs! Even though I’m never adequately trained for Megan’s and my annual half marathon, I love our tradition because I get to spend time with one of my dearest friends while also getting a glimpse into her life, which, day-to-day, is so different from my own. Every trip is an adventure. This trip was particularly fun because I got to meet Rex and because I got to experience that epic candy-fueled frenzy that is Halloween. Little did I know, I’d also get to celebrate World Vegan Day with my favorite vegan, Megan Lehnhoff. Halloween with the Lehnhoffs is much more exciting than my typical Halloween, which usually consists of me going to work in a cheesy Halloween t-shirt, meeting friends for drinks, and, generally, avoiding trick-or-treaters at all costs. I’ll scroll through photos of my friends’ kids, but otherwise my Halloween experience is pretty innocuous. Because I seem to have lost touch with the Halloween spirit, I was excited to spend the holiday with the Lehnhoffs. They and their neighbors know how to rock Halloween. The Halloween experience started with me marveling as Megan wrangled the kids into their matching monkey costumes while Scott helped prepare for the hay ride. Rex and Landri were adorable in their costumes. So adorable, in fact, that I thought to myself, for a fleeting moment, “Kids are cute, you should have some.” Shortly after that thought crossed my mind, however, I joined Megan in praying that neither kid pooped, because a blowout in those costumes would be disastrous. Once the kids were dressed and bundled up, we made our way across the street, ready for the fun to begin. Sure, it was impossible to get every kid to face the camera for a photo, but excitement was in the air as everyone assumed their spots on the hay bales and took off for the neighborhood’s Wicked Woods, a cool haunted experience consisting of a maze of vignettes manned by costumed Halloween lovers. We weren’t sure if the walk would be scary for Landri, but need not have feared. That girl loves candy. She loves it so much, in fact, that her ravenous desire for candy surmounts any fear she may have of scary clowns and monsters. She knows what she wants and wasn’t shy about barreling her way to the front of the line for treats, chanting along the way, “I looooooooove this! I looooooooove candy!” and pointing out all there was to see, “Look at this guy!” It was so much fun to watch her embrace Halloween and trick-or-treating. It was also fun to watch her discover the abundance of candy that exists in this world (and increase her brand awareness). We already knew that Landri liked lollipops. As it turns out, she also likes Milk Duds. And Whoppers. And more Milk Duds. She couldn’t wait to pour her candy bucket out all over the floor when we got home – like the big kids – and she had quite a haul for such a little person. While she did that, the other little monkey passed out in the dog bed. I’d say Halloween was a success! Not wanting Landri to overdose on sugar or rot her teeth, Megan and I took it upon ourselves to thin Landri’s candy supply after she’d gone to bed. Before we knew it, the chocolate was gone, the Skittles were gone, and the gum was gone. All that was left of Landri’s haul were lollipops, pretzels, and temporary tattoos, and Megan and I both woke up at the crack of dawn the next day – World Vegan Day, no less – with horrible hangovers. Candy hangovers….Just in time to run 13 miles. About halfway through the run our headaches wore off. 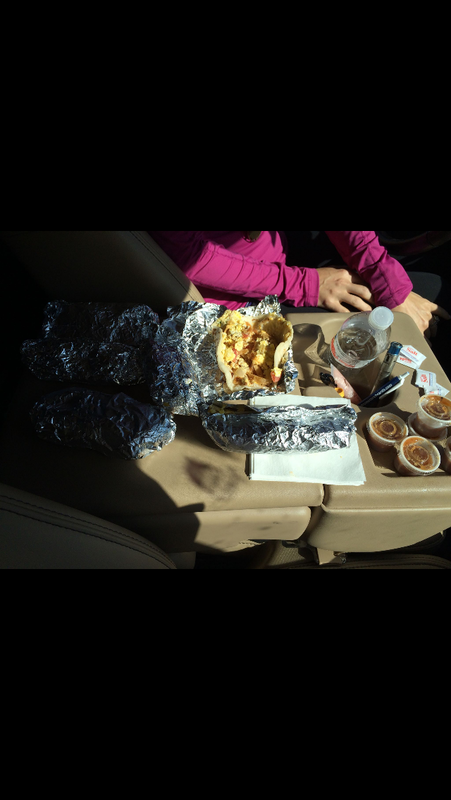 We finished the race, and, fully recovered from our candy hangovers, decided to reward ourselves and replace our caloric deficits with breakfast tacos from Panchito’s – a favorite college haunt. Sure, eggs and cheese aren’t vegan, but we just ran 13 miles. And I’m not in town very often. And we already ate all that candy….I don’t regret a single bite of those tacos. Further rationalizing our food choices, we decided to wash down the breakfast tacos with Frosties from Wendy’s. No room left in our stomachs, we headed home to relieve Scott and hang with the kids. World Vegan Day was a bust and it was only noon. Everything was calm upon our arrival at the house. Landri and Rex were fed, loving, and happy. They went down for naps like champs. “Man,” I thought to myself, “If this is what having kids is like, then sign me up!” Tired, Megan and I lounged on the couch watching reality TV reruns. Life was good. And then they woke. Or really, I should say Landri woke (because Rex remained his chill self for most of the weekend). Chaos ensued. Before we knew it, there were bracelets everywhere (girlfriend’s got quite a collection)! Markers everywhere. Landri impishly took her friend Camille’s water bottle, which resulted in a high speed chase through the kitchen. There were screams. There were cries. Landri smirked at Megan as she threw her markers across the room with gusto. The lids went flying! Landri smirked as she threw her pizza on the floor. Cheese everywhere! Landri was in time out. She was out of time out. She was back in. And every time, she knew exactly what she’d done. She just didn’t care. It was like all the sugar from the past week had been lying dormant in her tiny body and suddenly surged to the surface. Not knowing what to do, I poured myself a glass of wine. And I took that glass of wine with me everywhere, like a security blanket. I took my wine with me to bath time where, rather than calming her, the warm water seemed to invigorate Landri, bringing out what I like to call the evil genius. She poured a cup full of water on the floor. Then she retreated, lulling us into a false sense of security as she played sweetly with her toys. That’s when Megan made the fatal mistake of leaving me alone with her so she could put Rex to bed. . . Landri smelled my weakness. She sensed my fear. Without warning, she sprung out of the bath and ran into the room where Megan was dressing Rex. Unable to catch the slippery toddler, I waved my white flag in defeat, reached for my glass of wine (which was empty), and took on the easier task of occupying Rex while Megan negotiated with the little terrorist who, when given the option of “doing this the easy way or the hard way,” insisted that she wanted to do this “the hahd way.” I still don’t know how Megan managed to get a diaper, let alone pajamas, on that kid, but she did. I still don’t know how she got her to bed, but she did. Battle weary, we collapsed on the couch. Tomorrow would be another day! Trick or Trunking at school! Rex passes out in the dog’s bed! Special thanks to my friends Tanya and Chrissy for lending us the adorable matching monkey costumes for Landri and Rex, respectively! Previous Post Rexie Roo Roo is officially Mobile! Next Post Update: Lehnhoffs on HBO!